“Stop it, Mom! You’re freaking me out!” my daughter yells. She’s seated in the driver’s seat of my SUV. Today I’m the passenger. My right foot presses an imaginary brake. I squeeze the door handle tighter. My eyes scan every direction for possible hazards. Driver’s Ed classes may be preparing her for a driver’s license, but I’m ill-equipped. Her 16th birthday hurtles towards us, just like the mailboxes and oncoming cars seem to do. I have no control over this—not one bit—the growing up or the driving. My heart beats a bit harder these days. I have no little girls in summer dresses and frilly socks who hold hands and snuggle. I have two teenagers. They stretch and grow each day, discovering their independence and self-reliance. It’s age appropriate. It’s wonderful to witness. Yet it’s also a little heartbreaking. I’ve enjoyed watching my children unfold–truly–yet sometimes I long to go back. Rewind. Return to a simpler time. I may preach at the altar of mindfulness and present-moment awareness, but wrestle with practicing it all the same. Perhaps that happens to you, too. 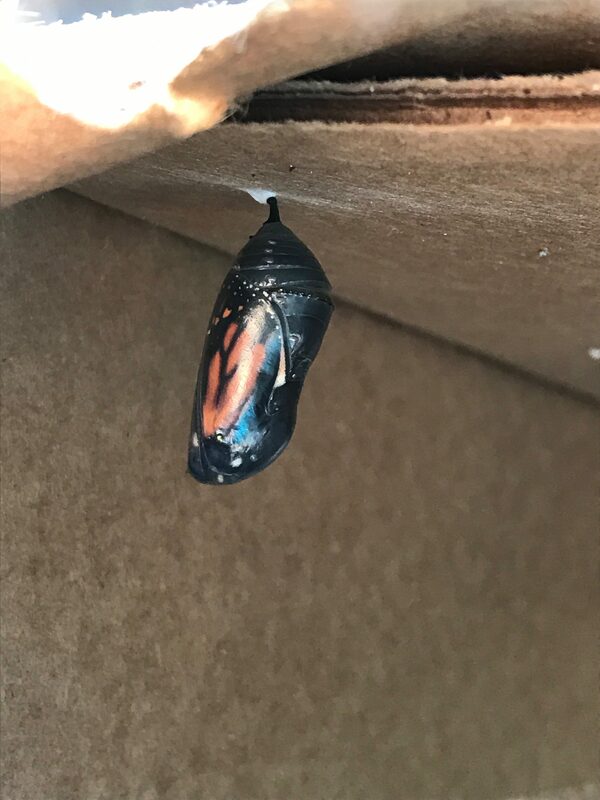 Freshly hatched, this caterpillar will grow dramatically. Last year, no monarch butterflies visited my garden’s milkweed. This summer, I felt heart-bursting joy when tiny caterpillars and eggs reappeared. I assembled cardboard and netted containers just as I’d done two years ago (see post here). I rushed to protect them. I want to provide the best chance for their survival. And yes, I’m a wee bit obsessed. Curious neighbor kids stopped often to monitor progress. Together we watched the milkweed for signs. My daughters teased me, but were just as interested. We named each caterpillar; names of cast members from the show Hamilton have been popular choices. My monarch preoccupation isn’t without reason. Their numbers are decreasing at an alarming rate. Milkweed is the only food source, and it’s rapidly disappearing. Each stage of their life cycle—egg, caterpillar, chrysalis (cocoon), and butterfly—is dependent on the prior stage. I find this dynamic, fragile cycle fascinating. 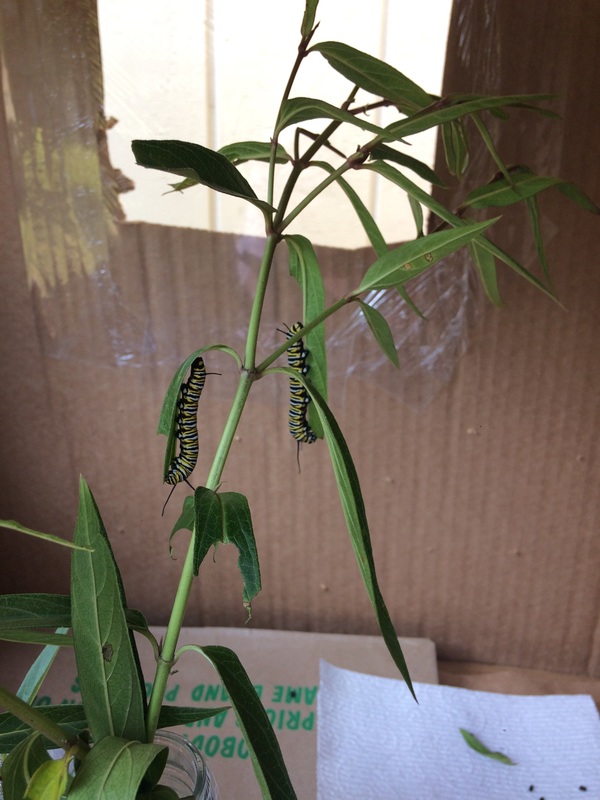 Monarch caterpillars—like snakes—molt as they grow. 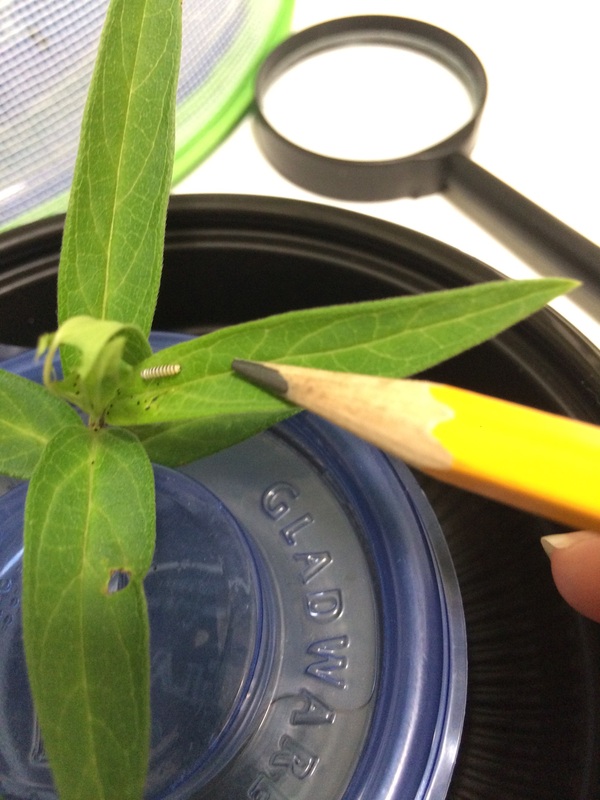 Their exoskeleton sheds 5 times as they binge-eat milkweed before going into chrysalis. If they don’t molt, they don’t grow. No molting, no butterfly. momentous cycle propels them to the glorious butterflies they are meant to become. Well, isn’t that an interesting lesson fluttering around me these days. After spinning a silk attachment, caterpillars change into jade green chrysalides quickly. In all fairness, my nearly 16-year-old drives well for a beginner. Her instructor confirmed it. 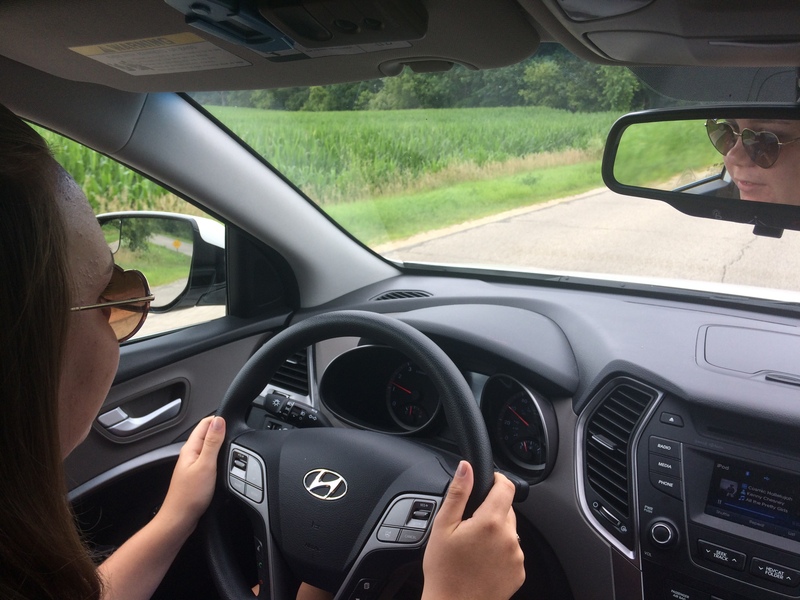 She told her, “You’re ready for the test and ready for your license.” Then supposedly added, “Tell your mom not to worry.” Smart instructor. 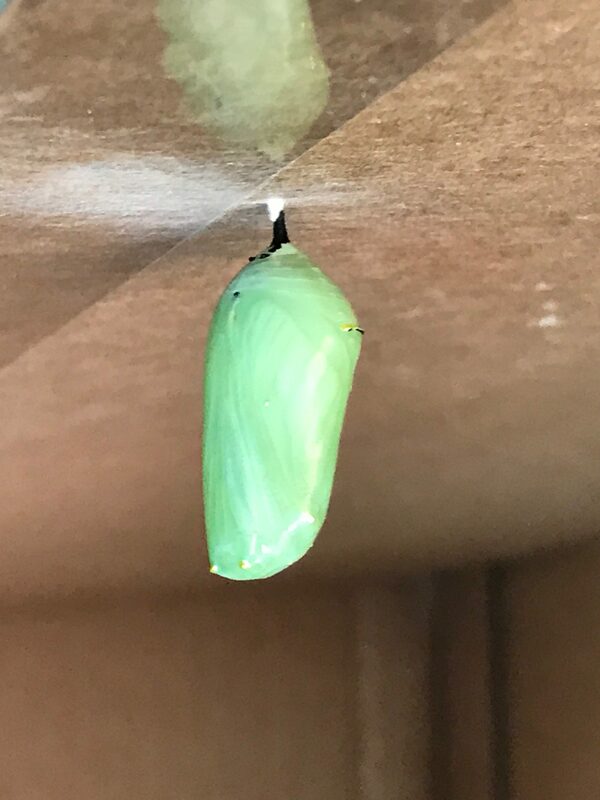 Several days later, the chrysalis becomes transparent, indicating it will release soon. Instead, it’s me who’s struggling. Despite all the cardboard containers I’ve created to surround and protect, I’m watching my daughter shed something that no longer fits. 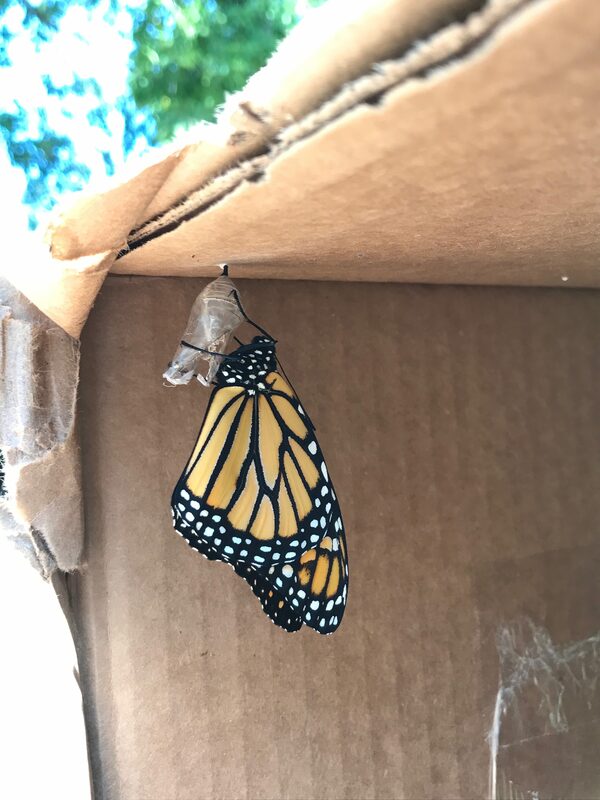 She’s one step closer to those wings unfurling, strengthening, and taking flight. The itchiness of my accepting these changes indicates I’m shedding, too. Old beliefs about my kids don’t really fit anymore. They are growing up. Unfolding into new skins. Stepping into new, more mature roles. Prepared or not, so am I. Prepared or not, aren’t we all? What a great analogy! Keep up the good work? This definitely speaks to me! Glad to hear that, Maureen. Thanks for telling me it did! Love this. I have 2 milkweed plants & I saw 2 monarch butterflies. I hope my plants survive the winter. I was more than nervous when the boys took driver’s ed. Our children grow up no matter if we’re ready or not. WOW this is relevant for me today. Change is good, necessary, scary and fun. In some ways it’s better to not have control because I fear I wouldn’t make the change myself. Thanks for sharing. Thank you Katie for this beautiful reflection ! I love everything you write and look forward to reading each one when it appears in my e-mail.